Experience the best of San Antonio at this all-suites hotel- close to the University of Texas at San Antonio, the AT&T Center and the Historic Downtown Riverwalk, 100% non-smoking! The Best Western Alamo Suites is an inviting, newly-renovated hotel committed to providing the best in customer service and accommodation at an affordable rate. The San Antonio hotel's ideal downtown location is close to the Alamo Historic Building, the Rivercenter Mall, Six Flags Amusement Park and SeaWorld San Antonio. Business travelers staying at this Texas hotel will love the close proximity to the San Antonio Convention Center, Lackland Air Force Base, HEB Corporation and the Coca Cola Bottling Company. Visitors looking for things to do in San Antonio will be minutes away from local events including the Fiesta in April, the Rodeo in February, Cinco de Mayo celebrations in May and the Christmas Lighting Festival in December. 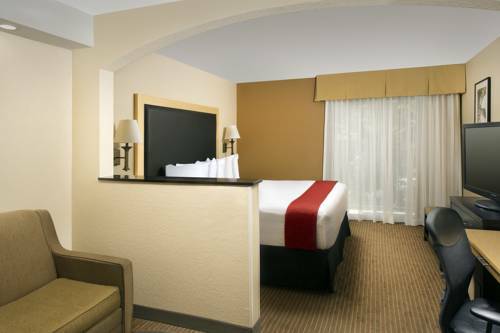 This San Antonio Texas hotel features spacious, well-appointed suites, including family suites and whirlpool suites. Each room is complete with a king size bed, microwave, refrigerator, free wireless high-speed Internet access and cable satellite television. Amenities at this San Antonio accommodation include an indoor swimming pool and hot tub, fitness center, free parking and guest laundry. Business travelers will appreciate the full business services and meeting facilities. A complimentary continental breakfast is available each morning. Enjoy all that San Antonio has to offer in a centralized location at the Best Western Alamo Suites! From: The east. Merge onto I-10 West, then merge onto I-35 North/I-10 West/US-81 North/US-87 North via Exit 572 towards El Paso/Austin. Keep left to take I-35 North/I-10 West/US-81 North/US-87 North towards Austin. Take Exit 155A towards South Alamo Street/TX-536-Spur. Turn slight left onto South Laredo Street. The Best Western Alamo Suites is at 1002 South Laredo Street, San Antonio, Texas 78204-3212. From: The west. Merge onto I-10 East. Keep left to take I-10 East/US-87 South towards Austin. Take Exit 155A towards South Alamo Street/TX-536-Spur. Stay straight to go onto South Pecos-La Trinidad Street. Turn left onto TX-536 Spur/South Frio Street/South Alamo Street. Turn left onto South Laredo Street. The Best Western Alamo Suites is at 1002 South Laredo Street, San Antonio, Texas 78204-3212. From: The north. Merge onto I-35 South/US-81 South via the exit on the left. Keep right to take I-35 South/US-81 South towards I-10/Houston/US-87/El Paso. Take Exit 155A toward South Alamo Street/TX-536-Spur. 2.00 mile(s) from San Antonio Riverwalk , walk in downtown night atmosphere and take tour of San Antonio history.